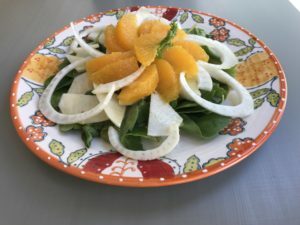 I don’t often think of serving oranges in summer, but this salad is so refreshing and the familiarity of the oranges encourages people to try it even if they aren’t familiar with jicama or raw fennel. Because the jicama is a great source of prebiotic fiber and the arugula is a cruciferous vegetable, this dish is an especially healthy choice to add to summer cookouts or fall tailgate buffets. 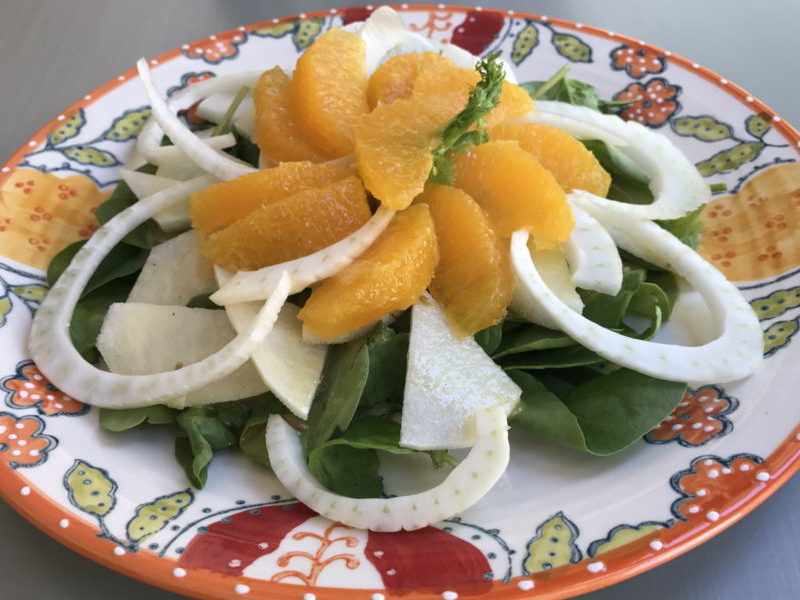 To make enough for a small platter of about six servings, you will need 4 navel oranges, 1 small jicama about the size of a small orange, 1 small fennel bulb, and 1 five-ounce box of mixed baby arugula and spinach. Prepare the oranges by slicing the segments away from each membrane, and set them aside. Peel the jicama and fennel and slice them into thin strips. Whisk together for a dressing: 2 tablespoons fresh squeezed orange juice, 2 tablespoons apple cider vinegar, 1 tablespoon Dijon mustard, 1 garlic clove, minced, ½ teaspoon salt, ½ teaspoon freshly ground black pepper, and 2 teaspoons maple syrup; then whisk in 4 tablespoons extra virgin olive oil. You can also boost the flavor by adding 1 teaspoon toasted fennel seeds to the dressing. Refrigerate the ingredients and dressing until shortly before you plan to serve. Assemble the salad by putting down a layer of arugula and spinach and layering jicama slices over the greens. Drizzle with dressing and then top with fennel. Arrange the orange sections on top and perhaps add more dressing. Spicy: You could spice things up using radishes instead of jicama or add them to these ingredients. Sweet: You could add blueberries or watermelon, or use either of these in place of the oranges. Green: You could add cilantro or parsley to the bed of greens. Serve at brunch after eggs, or with burgers and hot dogs at a cookout, or as an accompaniment to shrimp or fish tacos. For a light lunch you could add pumpkin seeds and avocado and serve the salad on its own.